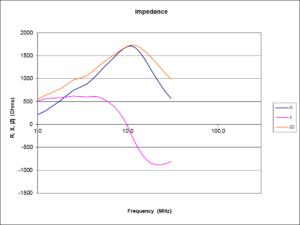 The question that arises is how do you measure the impedance of a component that is 250+mm between terminals. We can calculate the impedance of the core based on published core parameters which are in turn based on the manufacturer’s measurements. 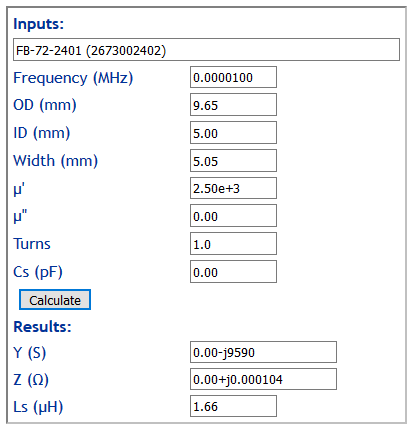 Above is a calculation of the inductance of 1 turn at low frequency (where permeability is the initial permeability, 2500 for #73 material). Firstly, let us calculate the impedance at RF based on the material characteristics and dimensions, but ignoring distributed capacitance. 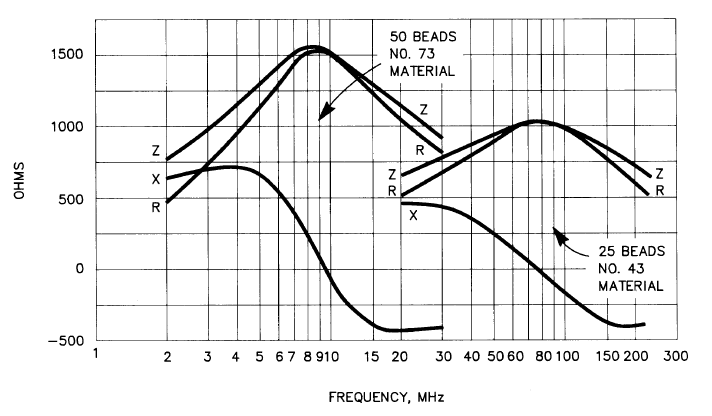 Above is a calculation of the impedance of the choke comprising 50 FB-73-2401 beads ignoring distributed capacitance. Clearly it is quite different to Maxwell’s plot. 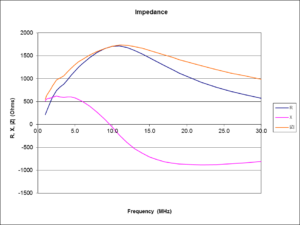 Let us now calculate the impedance at RF based on the material characteristics and dimensions, adding a lossless parallel capacitance. 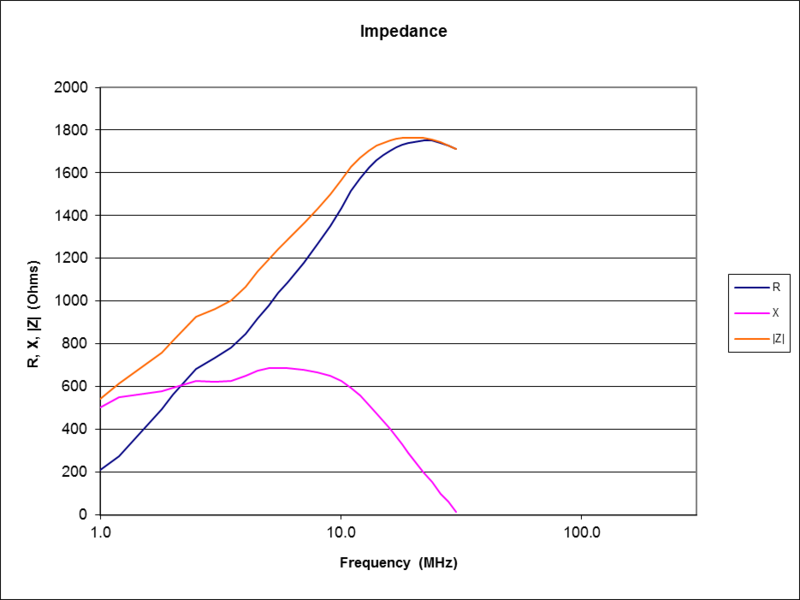 Adding 4.4pF gives very good reconciliation with Maxwell’s plot. My own experience is that the equivalent capacitance of toroidal inductors of 11t as often used for common mode chokes usually exhibit an equivalent capacitance in the range of 1-3pF. 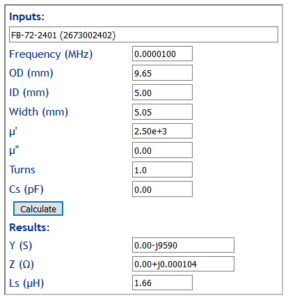 The question that arises is whether 4.4pF is what one might expect of such an inductor, or whether it is an artifact of Maxwell’s measurement fixture. 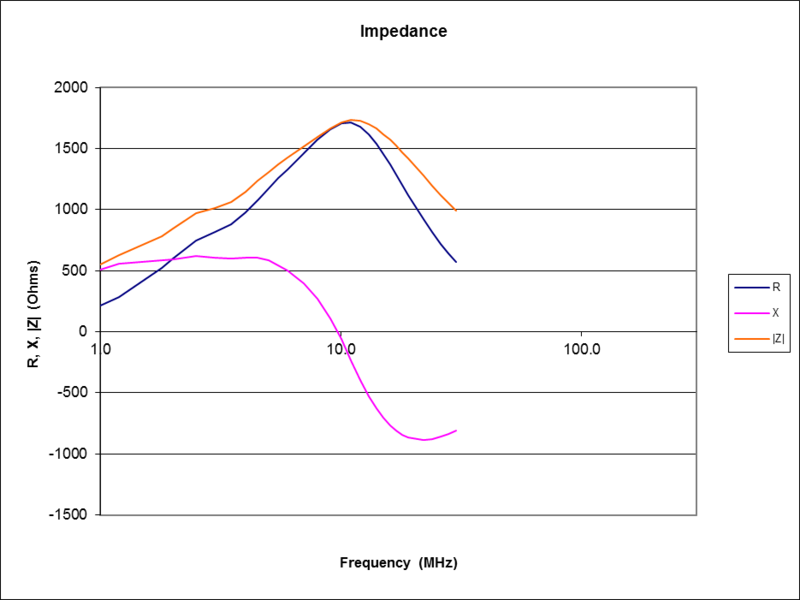 It would seem quite likely that the choking impedance is closer to Fig 3 than to Fig 1. 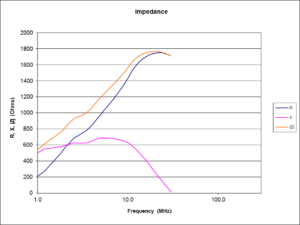 For convenience, Fig 5 above is Fig 3 with linear frequency scale. 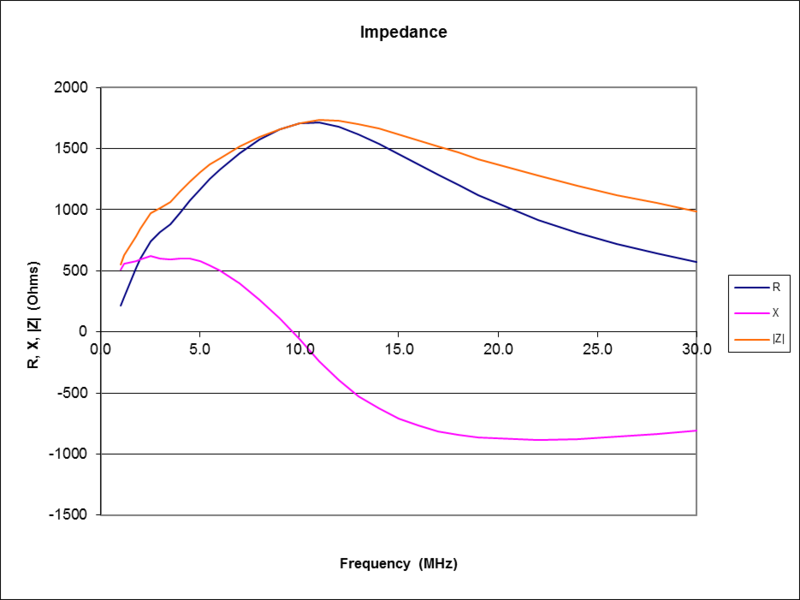 It can be seen from Fig 5 that the common mode impedance is lowish at 3.5MHz, and although at higher frequencies is better, it is not an outstanding balun. Maxwell describes a linear structure, but some implementations vary the physical layout to coil the balun inside an enclosure. 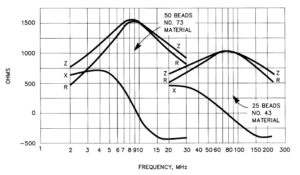 These types of structures must have a lower self resonant frequency and equivalent shunt capacitance, leading to a narrower and higher impedance peak, and lower impedance at the high end of HF. Another common variation is selection of a different core size and / or core material, and of course that affects the impedance obtained. Various ‘other’ configurations are sold, often as an “isolator”, and almost always without any meaningful specification of their common mode performance.